بهینه سازی توپولوژی براساس قابلیت اعتماد، منجر به یک توپولوژی بهینه با ارضای قیودی که شامل عدم قطعیت متغیرهاست، می‌گردد. به دلیل عدم قطعیت‌های ذاتی از قبیل بارگذاری خارجی، خواص مصالح و کیفیت ساخت، نمونه های اولیه و اعضا تولید شده ممکن است عملکردهای مورد نیاز را ارضا نکنند. 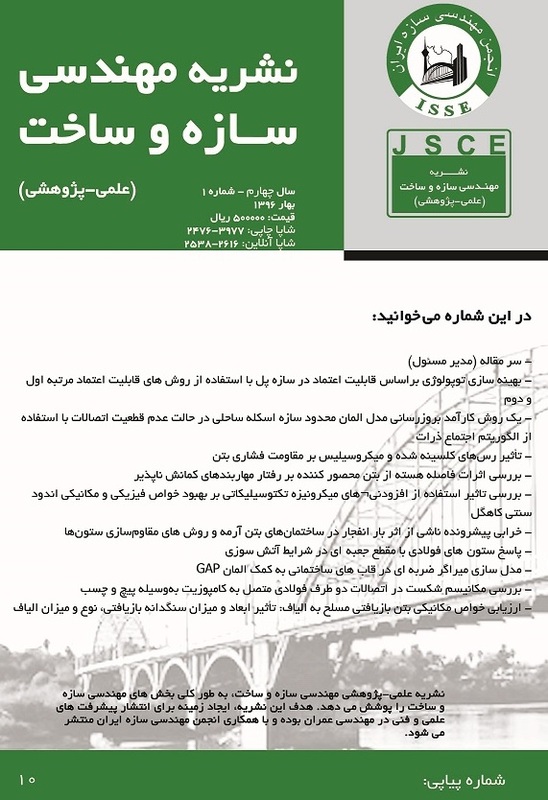 در بهینه سازی توپولوژی بر اساس قابلیت اعتماد، هرکدام از این پارامترهای عدم قطعیت به عنوان متغیر تصادفی در نظر گرفته می‌شود و قیود قابلیت اعتماد، به منظور حاصل شدن سازه قابل اعتمادتر در فرمول بندی مسئله بهینه سازی توپولوژی استفاده می‌شود. در این مقاله، به منظور به دست آوردن توپولوژی قابل اعتماد در دو سازه پل، بهینه سازی توپولوژی براساس قابلیت اعتماد از روش ریز ساختارهای ایزوتروپیک جامد با جریمه، استفاده شده است. روش‌های قابلیت اعتماد مرتبه اول و دوم به عنوان روش‌های تحلیل قابلیت اعتماد، به منظور در نظر گرفتن پارامترهای عدم قطعیت مربوط به بارگذاری،‌ مدول یانگ و ضخامت استفاده می‌شود. مشخص شد که در توپولوژی‌های بهینه به دست آمده به وسیله بهینه سازی توپولوژی براساس قابلیت اعتماد، مقادیر نرمی بالاتر از مقادیر متناظر به دست آمده از روش بهینه سازی توپولوژی قطعی می‌باشد و با افزایش تعداد پارامترهای عدم قطعیت، نرمی سازه بیشتر می‌گردد. Reliability-based topology optimization (RBTO) results in an optimal topology satisfying given constraints with consideration of uncertainties in the variables. Due to inherent uncertainties, including external loading, material properties, and the quality of construction, prototypes and products may not satisfy the essential functions required. In RBTO, each of these uncertain parameters are treated as random variables and reliability constraints are used in the formulation of the topology optimization problem to obtain a more reliable structure. In this article, RBTO was applied to obtain reliable topologies for two bridge structures using the Solid Isotropic Microstructure with Penalization (SIMP). The first and second order reliability methods are used as reliability analysis methods to take into account the uncertainties of the load, Young's modulus and thickness. It was found that in optimal topologies obtained by RBTO, the corresponding compliance values are higher than values obtained by deterministic topology optimization (DTO) and increase the number of uncertain parameters which results in softer structures with higher compliances. حسنی، ب؛ و قاسم نژاد مقری، ح؛ « بهینه سازی توپولوژیک لایه تقویتی سازه­های صفحه­ای با استفاده از قید تنش»؛ هشتمین کنگره بین­المللی مهندسی عمران، دانشگاه شیراز، شیراز، ایران، 23-21 اردیبهشت 1388. Bendsoe, M. P. and Sigmund, O.; “Topology optimization: theory, methods and applications”; 2nd edition, Springer, Berlin. (2002). Nowak, A. S. and Collins, K. R.; “Reliability of Structures”; 2nd edition, Boston, McGraw-Hill. (2000). Kharmanda, G., Olhoff, N., Mohamed, A. and Lemaire, M.; “Reliability-based topology optimization”; Structural and Multidisciplinary Optimization, 26 (5), (2004) 295-307. Kim, C., Wang, S., Bae, K. R., Moon, H. and Choi, K. K.; “Reliability-based topology optimization with uncertainties”; Journal of mechanical science and technology, 20 (4), (2006) 494-504. Jung, H. S., and Cho, S.; “Reliability-based topology optimization of geometrically nonlinear structures with loading and material uncertainties”; Finite elements in analysis and design, 41 (3), (2004) 311-331. Kim, S. R., Park, J. Y., Lee, W. G., Yu, J. S. and Han, S. Y.; “Reliability-based topology optimization based on evolutionary structural optimization”; International Journal of Mechanical, Aerospace, Industrial, Mechatronic and Manufacturing Engineering, 1 (8), (2007) 135-139. Yoo, K. S., Eom, Y. S., Park, J. Y., Im, M. G. and Han, S. Y.; “Reliability-based topology optimization using successive standard response surface method”; Finite Elements in Analysis and Design, 47 (7), (2011) 843-849. Luo, Y., Zhou, M., Yu Wang, M. and Deng, Z.; “Reliability based topology optimization for continuum structures with local failure constraints”; Computers & Structures, 143, (2014) 73-84. Saltelli, A., Ratto, M., Andres, T., Campolongo, F., Cariboni, J., Gatelli, D., Saisana, M., and Tarantola, S.; “Global sensitivity analysis: the primer”; 1nd edition, John Wiley & Sons. (2008). Zhang, X., and Ouyang, G.; “A level set method for reliability-based topology optimization of compliant mechanisms”; Science in China Series E: Technological Sciences, 51(4), (2008) 443-455. Zhao, Y. G., and Ono, T.; “New approximations for SORM: Part 1”; Journal of engineering mechanics, 125(1), (1999) 79-85. Johari, M.;“Reliability-based topology optimization of continuum structures under static loads”; M. Eng. dissertation, Yazd University, Yazd, Iran. (2015).